Ayn Rand was a Russian-American novelist, philosopher, playwright, and screenwriter. Rand is best known as author of The Fountainhead and Atlas Shrugged. She developed a philosophical system called Objectivism. There is a new movie version of Atlas Shrugged being released in two parts. You can see the trailer for Atlas Shrugged Part 1 here www.atlasshruggedpart1.com/atlas-shrugged-movie-trailer. This movie may extend the fiction of John Galt. 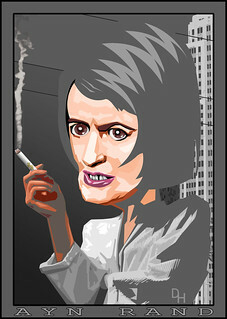 The reference image for the body of Ayn Rand is a Creative Commons licensed image from codepo8's Flickr photostream.